Fishing the waters surrounding Fort Myers, Sanibel and Captiva can produce fantastic results. Snook, Redfish, Speckled Sea Trout are just a few species that are living in these waters. You can target one, but are likely to catch 6, 8, 10 or more different species fishing the same type of bait, using the same techniques and even the same area. My great friends from Omaha, came for a visit and enjoyed the bountiful waters. Carl and Marilyn Mammel enjoyed a couple of charter days out with Captain Blake on the Blue Egret and had a great fresh fish dinner that night. 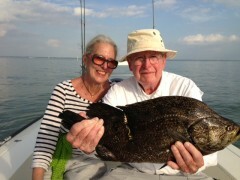 Carl caught a nice Tripletail but Marilyn’s got away. Notice this one did escape a threat early on in his life but Carl wasn’t about to let that happen again. Tripletail are a worthy opponent as they jump and pull drag trying to escape the dinner table. Moving to the backcountry produces a number of different species such as the beautiful Redfish. 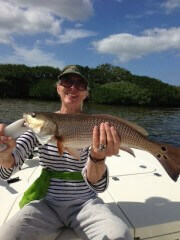 Marilyn did get her revenge by outsmarting a number of Snook and this nice Redfish. This one was lucky as the Mammel’s do mostly practice “catch and release”. We had a great couple of days on the water. The weather was beautiful but the company was special! See you guys soon.